Over the next 12 days, Kiefer Consulting will be sharing their favorite Office 365 tips and tricks. We come bearing gifts! 12 of them! The holiday season is upon us! As we find ourselves rushing around, it becomes clear that the greatest gift anyone could possibly give us would be the gift of “time”. Over the next 12 days, Kiefer Consulting will be sharing their favorite Office 365 tips and tricks. These little-known features and capabilities of Microsoft Office 365 will save you time and help you be more productive. Every weekday between Friday, December 7 and December 25, Kiefer will share one exciting trick or feature that will change how you work. We are talking about features that you’ll use all the time. You will wonder what took you so long to discover it! 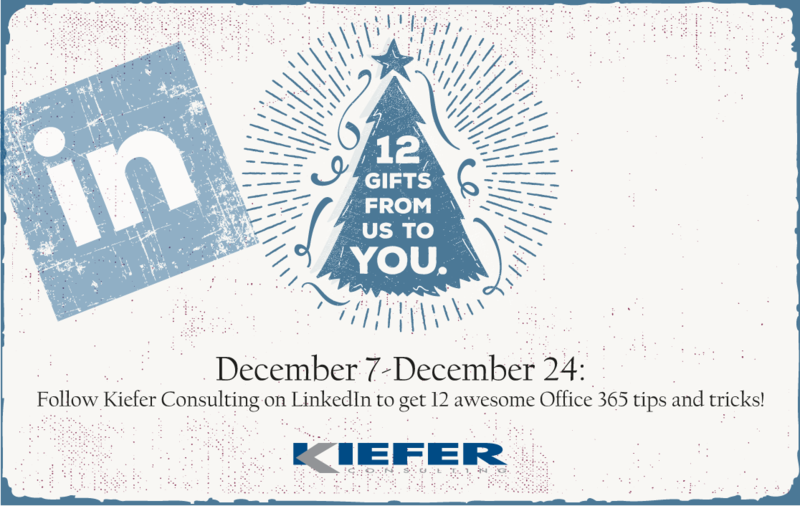 Be sure to Follow Kiefer on LinkedIn for your gifts. They will be sharing one a day! You can also see the 12 gifts blog on the Kiefer website (www.kieferconsulting.com). It will be updated every day! Kiefer Consulting would like to wish the entire TechWire community the happiest of holidays!